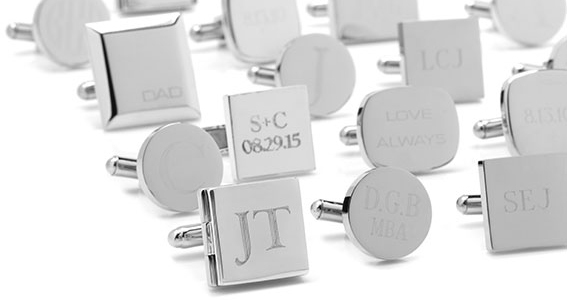 There is no better way to turn a gift into a keepsake than with engraved cufflinks for men. Personalized cufflinks are not only versatile and stylish, but also offer a thoughtful gift that can be custom-tailored with initials, a special date, or meaningful phrase that will be treasured for years to come. Choose from our wide selection of stainless steel, titanium, and sterling silver engravable cufflinks that are engraved using a precise diamond cutting method. All orders are engraved quickly and typically ship within 2 business days. Shop additional engravable gifts including tie bars, money clips, bottle openers and even flasks.